Ask fellow campers about "Mirabel Trailer Park" and nearby attractions. Old, run down park. Unfriendly and near nasty management. Old, dirt filled site, not level, small. Just electric and water, no sewer. Most folks stay here are the permanent type with old, run down rigs. Stayed here one night. We will avoid this one in future. We camped at Mirabel Trailer Park in a Travel Trailer. Un-kept camp sites, in between river and hwy 116. Loud noise from hwy all night. Bath room and showers needed some TLC. We camped at Mirabel Trailer Park in a Tent. Older, nice RV park. Has lots of trees, a very nice staff and is located close to wine country. Would stay here again. We camped at Mirabel Trailer Park in a Motorhome. 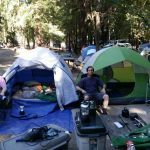 If you don't expect much, then you will really like Mirabel Campground on the Russian River. There are no amenities, and a lot of the RVs there are very old and run down. But you are camping in and amongst giant redwoods and the price is hard to beat. The $15. above is based upon a weekly rate with one dog. Portions of the park can be kind of rowdy on the weekends, but we were in an area that was definitely more secluded. The electricity system is very old and we were told we could not use AC. That coupled with no cable and no Wi-Fi caused us to leave after 4 weeks. Prepare to need to sweep the roof of your rig at least once a week, as lots of dirt constantly reigns down from the huge trees. The park is very well located in that it is half way between Guerneville and 101 with SF being about 60 miles away. The manager was a rather crusty lady who certainly did not mince words or go out of her with with customer service. We would stay there again for a short time. We camped at Mirabel Trailer Park in a Fifth Wheel. Are you affiliated with Mirabel Trailer Park ?